Proper cleaning of your hardwood floor will not only make it look good and attractive but also will improve its longevity. Therefore, vacuum or sweep your hardwood floor with a soft bristled broom especially in areas that experience high foot traffic. This will help prevent gritty dirt and build up of particles that can scratch the surface of the wood. Avoid vacuum or brooms with beater bars or the power rotary head. Instead, use a vacuum with a bare floor attachment to avoid causing damage to the floor. Research shows that your hardwood floor will fade if it comes in contact with the harmful UV rays and excessive heat from the sun. When sun rays strike the floor regularly, its aging rate will accelerate. With no time, it will look old and even crack due to much heat. Therefore, consider using protective window coverings that will block this Rays. Sheers and blinds are better in protecting the floor from the effects f direct sun rays. Furniture guards are very important gadget in maintaining wooden floors. Note that furniture can cause significant damage to the wooden floor if not well checked. Therefore, protect your hardwood floor by fitting foot guards under the furniture. Additionally, while moving the furniture from one point to the next, avoid dragging them across the floor as it can result in damage too. Foot guards will not only protect the floor from damage but also will keep it looking good for many years to come. By so doing, you will not incur any repair cost regularly. For example, high heels will dent your hardwood flooring. Heavy shoes will scratch, dent and scuff the floor. Children car toys can result in some damage as the children love racing their cars models and toys across the floor. Consider wearing slippers or remain in socks to maintain your wooden floor for years. The above tips are key to maintaining hardwood flooring. They will help you maintain your floor and increase its longevity. Proper maintenance will save lots f bucks in repairing or even replacing the entire floor. For information regarding the best hardwood floors, best contractors and many more, visit larchdeck.com. 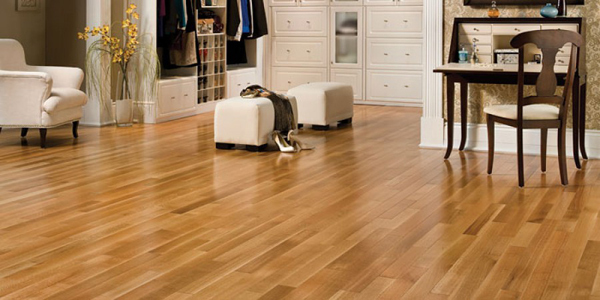 The quality and longevity of your hardwood floor lie behind the maintenance practices you do.